According to a statement issued by the National Weather Service (NWS) on Tuesday, a flood warning is in effect for Central Pima County, Arizona, till early Wednesday morning. Authorities said Tuesday Menagers Dam in the Tohono O’odham reservation could fail or overflow due to heavy rain and flooding due to remnants of Tropical Storm Rosa. Tohono O'odham officials said they are evacuating more than 30 people from the Kohatk village in Pinal County, located about 74 miles south of Downtown Phoenix, local television station Fox 10 reported. Tohono O’odham Nation is a federally recognized tribe of Native American people who live in the Sonoran Desert, residing primarily in Arizona, U.S. and Sonora, Mexico. 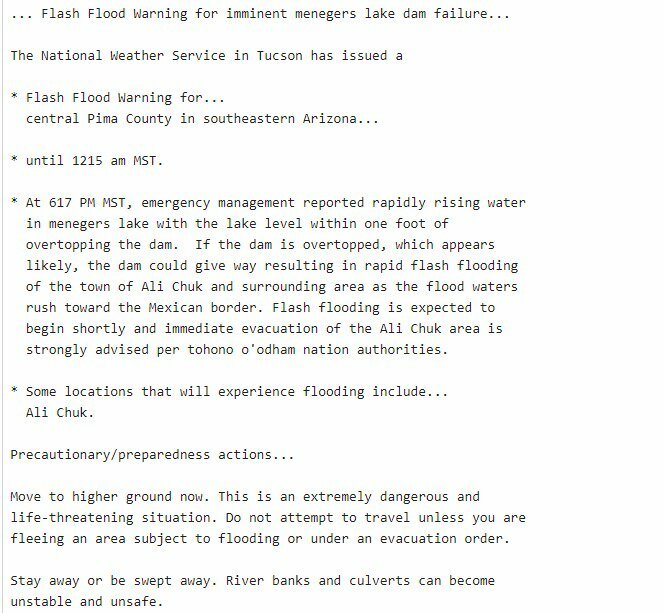 The flood warning for areas including Santa Cruz and Kupk will remain in effect until 3.30 a.m. MST (5.30 a.m. EDT) Wednesday, according to NWS. The town of Ali Chuk, which had over 162 residents as of 2015, might face flash flooding, it added. The agency said the banks of Vamori Wash in Tohono O’odham Nation were well above bank full at 8.47 p.m. MST (10.47 p.m. EDT). A report on KGUN9, an ABC-affiliated television station, said the water level in Menagers lake was rising and was within one foot of overflowing. The alert asked people living in Ali Chuk to move to higher grounds as it was an “extremely dangerous and life-threatening situation." "Do not attempt to travel unless you are fleeing an area subject to flooding or under an evacuation order. Stay away or be swept away. River banks and culverts can become unstable and unsafe,” it said. The NSW report said rainfall amounting to about 3 to 4 inches will continue overnight, which could cause flooding. Glenn Lader, a meteorologist with the weather service in Tucson, said certain areas of the reservation already received up to 7 inches of rain in the last 72 hours, while 3 to 5 inches of rain was widespread on the reservation. Lader said the Menagers Dam was an old earthen dam with a height of 22 feet. The water level at the dam was at 9.60 feet at 8.15 p.m. MST (10.15 p.m. EDT). Due to additional water coming from upstream, the valves of the dam will possibly remain stable overnight, the weather service stated. The NSW asked people in these areas to be “especially cautious” at night as it would be harder to judge and recognize the dangers of flooding. Excessive runoff from the heavy downpour might cause flooding of washes and streams, farmlands, country roads, and other low lying spots, said the statement.